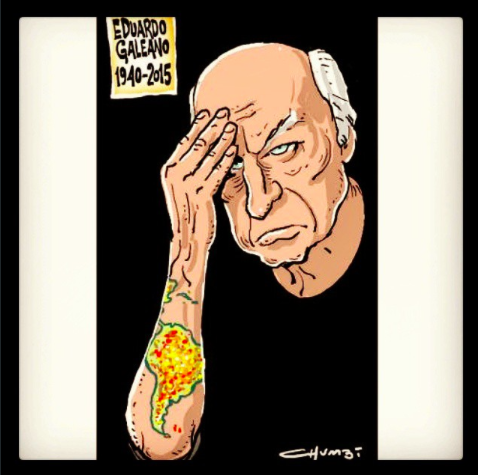 Eduardo Galeano by Argentinian cartoonist Pablo Fernando Chumbita “Chumbi”. Image taken from Instagram with authorization. Uruguayan author Eduardo Galeano was fond of writing about historical events that took place in April. He wrote about Brazil's 1964 military coup, Picasso's 1973 death in France, Morocco's 1987 completion of a wall across the Sahara desert, and much more. It was on a day in April that Galeano died this year at the age of 74 after battling lung cancer for several months. Today, when his own death forces us to look to ourselves in the mirror of those words, we woke to the news with sadness that we lost Eduardo Galeano, our founder, a member for years of our Advisory Council, and a regular contributor. In the 1970s, Galeano attained worldwide recognition for his 1971 book, “The Open Veins of Latin America” — the same book Hugo Chávez gave Barack Obama, when they first met in 2009. Later in life, Galeano criticized his own book, which is still used in classes on Latin American politics. Eduardo Galeano was a great phrasist. He has always sided with the victims. A few days ago in Montevideo, I tried to visit him, but it was already too late. Last March 1, Galeano received Bolivia's president Evo Morales in his house, but this was hard for him since he already had health problems. Galeano collected episodes, feelings and ideas that shocked him from our history and he gave them back to us so that we do not forget them. “Eduardo, I have a problem, I am get very distracted and sometimes I find it very difficult to follow a conversation.” To which he replied, “I'm also clueless and one of the worst.” From that moment on, everything flowed naturally, as if we were old friends. Eduardo started talking, while my wife and I listened. We felt we were listening to time narrating stories. Today is a sad day for all of us Latin Americans. Eduardo Galeano, one of the most important writers of our continent, has died. It is a great loss to all who fight to see a Latin America that is more inclusive, just, and in solidarity with our people. To all Uruguayans, friends, and our huge Latin American family, I want to pay my respects and remind you to keep on walking with eyes on the horizon, in our utopia. ¡Hasta siempre Galeano! You might be gone, but your voice will stay through your texts. Global Voices author Fernanda Canofre contributed to this text.